With the Monterey Car Week set to take place real soon, Acura has lifted the wraps off of the 2018 RLX. Featuring a brand-new design and a long list of technologies, the brand’s flagship sedan will join its smaller siblings – the TLX and ILX. Starting at the front, the new RLX features a new pentagon grille inspired by the 2016 Precision Concept, flanked by redesigned Jewel Eye headlamps that better accentuate their shape. Other revisions include a sculpted bonnet, a new front bumper and new wheel designs. By comparison, the changes at the rear are a little less bold, where new LED taillights, a gloss black diffuser and new chrome exhaust finishers have been introduced. 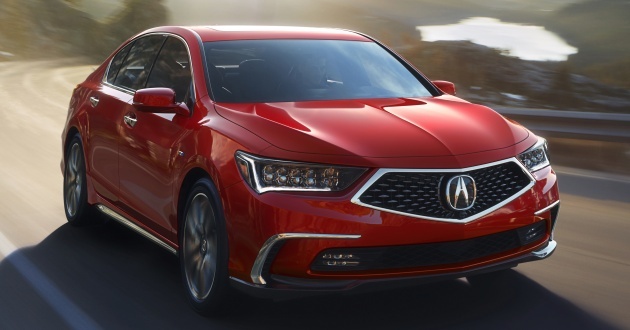 Acura says the RLX will be offered in three additional exterior body colours, two of which – Brilliant Red Metallic and Majestic Black Pearl – are new premium paint offerings. Inside, everything remains as per pre-facelift in terms of layout, although the 2018 model year gets upgraded materials and contact points. Also new are the redesigned seats featuring high-contrast piping and stitching, as well as a new Espresso interior option, the latter for those who prefer a little more sophistication. 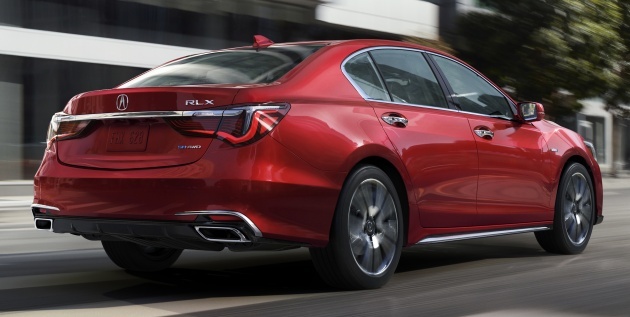 As before, the RLX is offered with the brand’s Sport Hybrid Super-Handling All-Wheel Drive (Sport Hybrid SH-AWD) technology, which combines a direct-injected 3.5 litre V6, lithium-ion battery, seven-speed DCT automatic transmission and three electric motors. On that last bit, one electric motor is integrated within the DCT, whilst the there is one on each of the rear wheels. Acura cites a total system output of 377 hp and 462 Nm, which is identical to before, but it claims the RLX’s powertrain and dynamic handling have been further optimised based on developments from the NSX. If the non-hybrid variant is preferred, the RLX gets the same 3.5 litre powerplant but without the electric motors (obviously). The output in this instance is unchanged at 310 hp and 369 Nm, but drive is now relayed to the front wheels via a new 10-speed automatic transmission that displaces the previous six-speed unit. Also unique the front-wheel drive RLX is Acura’s adorably-named Precision All-Wheel Steering (P-AWS). Standard features on the 2018 RLX Sport Hybrid include a premium Krell Audio System, surround view camera, parking sensors, LED fog lights, remote engine start, ventilated and heated front seats, heated rear seats and steering wheel, as well as the AcuraWatch suite of safety and driver assistance systems. 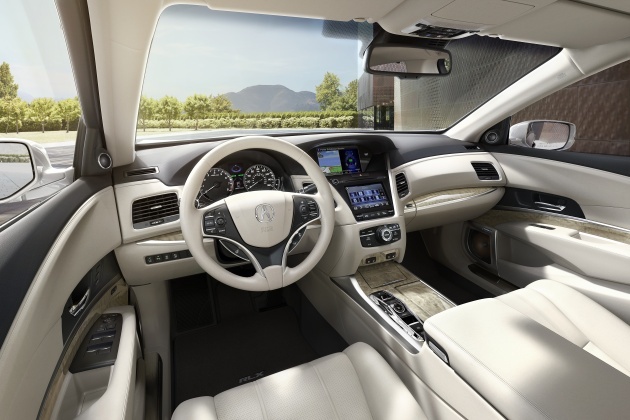 The suite comes with a new Traffic Jam Assist, plus Adaptive Cruise Control with Low Speed Follow, Traffic Jam Assist, Collision Mitigation Braking System (CMBS) with automatic emergency braking, Lane Departure Warning (LDW), Forward Collision Warning (FCW), Lane Keeping Assist (LKAS), Adaptive Cruise Control (ACC) with Low-Speed Follow and Road Departure Mitigation (RDM). This is a bigger car. It’s based on the Legend, which is one rung above the Accord. Glorified Accord is TLX. RLX known as Honda Legend for the JDM. RLX will be compared with Toyota Avalon, Nissan Maxima, Hyundai Azera, Kia Cadenza. For a luxury brand this is backwards. Shame on you Honda. Pls Honda Acura. Use your 3.5V6 earth dreams engine and make it twin-turbocharged. It looks better than the pre facelift version. And while the old beak is gone, this new wide grille doesnt look as special as Audi or Lexus. But the saddest thing is, put this next to the 2nd gen Acura Legend (from the early 90s), and its obvious the older car is way better looking. That long hood, short front overhang with long sleek body still looks great more than 2 decades later. Do miss the timeless designs Honda/Acura did in the 80s and 90s.